Cashmere wool is sourced from the thick fleece of the cashmere Pashmina goat. It is considered to be some of the world's finest wool. This luxurious fiber has inspired designers and is sought after by excited consumers who also want to be eco-chic. The finest quality cashmere is based on yarn purity and tightness of the knit. The longer strands give the garment a flatter and tighter feel. Once the garment is washed, the strands get fuller and softer. There are many qualities of cashmere wool. Manufacturers who use the shorter fibers which cost less produce cheaper and fluffier garments which pill and wear out faster. Always handle your garment with care and read the label instructions. Dry cleaning is not recommended and do not put in the dryer. Dyed yarns may release color so don't panic if you see color in the water. Dissolve a natural mild soap (cashmere shampoo) in water before immersing garment. Gently agitate by hand and let it soak for half an hour. Rinse with room temperature water until all soap is gone. Do not wring. Lay out flat on a towel and roll to remove excess water. Lay sweater out flat on a clean dry towel. Reshape and dry away from heat and sun. When it's partly dried, place on clean dry towel with the flip side up. Make sure garment is completely dry before storing. Store folded in a garment bag in a cool, dry place or cedar chest, and not on hangers. With good care, your cashmere clothes will stay gorgeous looking and last a very long time. Pashmina cashmere wool is actually a very unique wool fiber. The industry sets certain specific criteria that have to be met which may vary by country. Not all goat down is cashmere and that's partly what makes it such a valuable fiber. Trendy designs have added to the appeal and popularity of cashmere. Consumers are drawn to the refinement and elegance of cashmere clothing, fabrics, and yarns. You don't have to feel guilty about looking good when you dress in cashmere with eco friendly values. For beautiful cashmere sweaters and designs that fit your style, budget and conscience, look no further. These ecologically sensitive fashions will provide timeless style to your wardrobe. 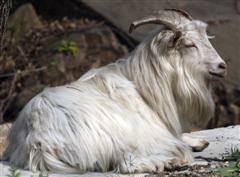 Cashmere goats are low-maintenance and thrive by free-grazing on natural pasture without chemicals, toxins or hormones. Producers encourage good health through their more holistic management practices. Goats are shorn or combed during their natural moulting season. Both methods are time consuming and tedious which results in the typically higher cost of cashmere. Most of the cashmere comes off the sides and back of the goat, right from the shoulder to the rump and can be woven into yarn for both light-weight and heavy-weight fabrics. The coarse guard hair is removed by hand leaving the fine and soft undercoat fibers. This process is called "de-hairing". The cashmere fibers yield highly because of their softness and purity. The coarse guard hair is used for brushes and non-apparel. The natural animal grease and dirt is removed and the cashmere is then ready to be processed into yarn and converted into cashmere clothing or fabrics. The annual world clip has been estimated at between 15,000 - 20,000 tons of raw cashmere wool with natural color ranges from white to black and natural shades in between.